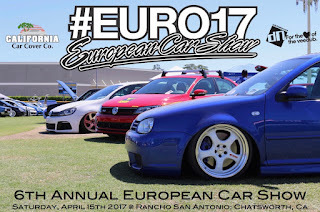 On Saturday, April 15th is the 6th Annual European Car Show hosted by California Car Cover and dub-Nation. We are looking forward to another large crowd of European car owners to get together to raise some money for Rancho San Antonio. This will be the 3rd year that we host the event at Rancho San Antonio. This campus in Chatsworth is an excellent venue for our attendees. With plenty of grass parking and shade, everyone really enjoys the setting. Last year, we were able to raise $2600 for RSA and look to improve upon that in 2017. Registration for the show opened last week. Tickets can be purchased on the Eventbrite page for the event. Tickets are only needed per vehicle. Additional passengers and spectators do not need to purchase tickets. General admission is free and there is plenty of street parking for spectators. Additional show details can be found on the European Car Show Facebook Page or by following @eurocarshow.us on Instagram. We look forward to seeing everyone on April 15th. For the March 2017 monthly special at California Car Cover, we are offering 5% off on our collection of Drum Works Furniture. This unique chairs and benches are constructed of metal drums, refinished and outfitted with cool automotive decals. 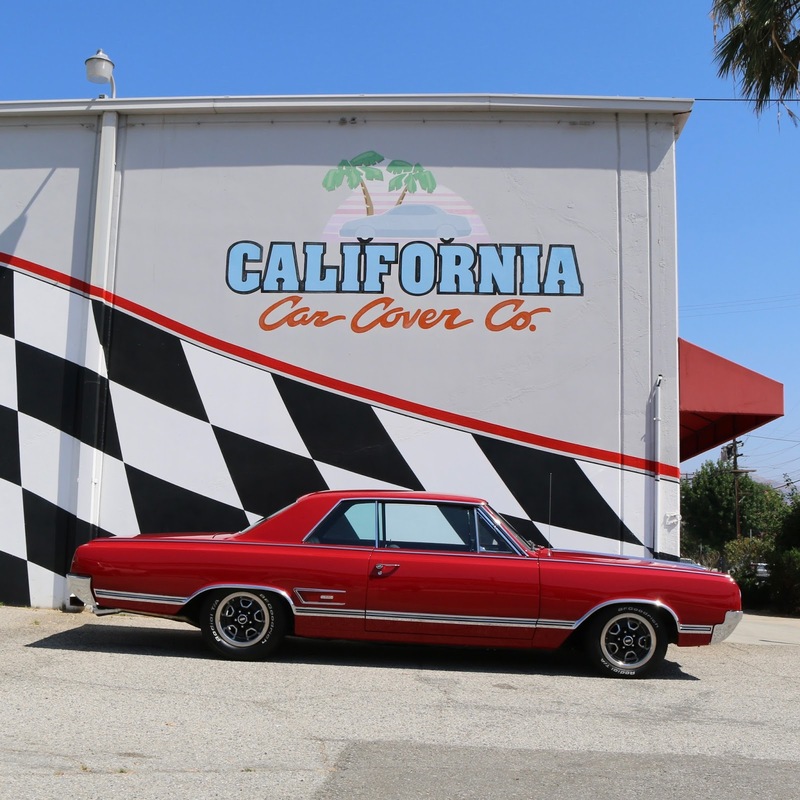 Drum Works Furniture has been available at California Car Cover for the past year and the custom benches and chairs have become a customer favorite. Available in a variety of color combinations and decals. The Flying A Gasoline chair is available exclusively at California Car Cover. Remove the padded cushion on the Drum Works Furniture Club Chair and use the opening as storage for magazines, books or anything else you want to stow away in your man cave or garage. To view the complete collection of Drum Works Furniture available at California Car Cover, please visit our website. Our first Saturday Social of the year took place this past Saturday at the California Car Cover headquarters in Chatsworth, Ca. It is a free community event to get local auto enthusiasts together to talk cars, coffee and of course, car covers. The first Social of the year attracted some nice muscle cars and hot rods to our facility for a few hours on Saturday morning. We are working with our local vendors, customers, car builders and more to make the Socials a unique experience. Please follow us on Facebook or Instagram to see what's planned for each get together this year. The Saturday Socials will take place throughout the year at California Car Cover. Please check out the California Car Cover website and Facebook page for complete details for each event. 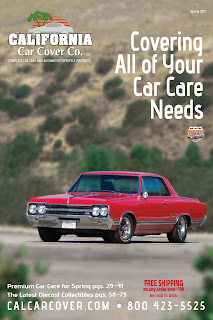 Our second spring car care guide features a 1965 Oldsmobile 442 on the cover. One of our local customers, Michael Branton, owns this clean 442. Michael owns a nice collection of muscle cars and we have been trying to shoot one of them for a California Car Cover catalog cover for a long time. Glad we were finally able to set aside some time to shoot this 442. 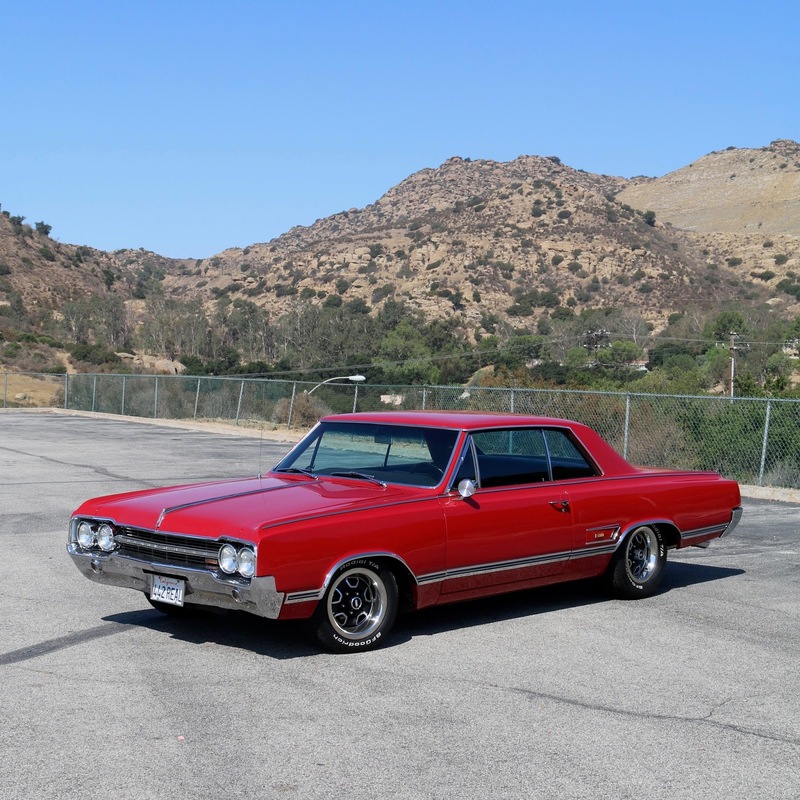 We asked Michael a few questions about his Oldsmobile and his love of muscle cars. CCC: How did you acquire this Olds 442? 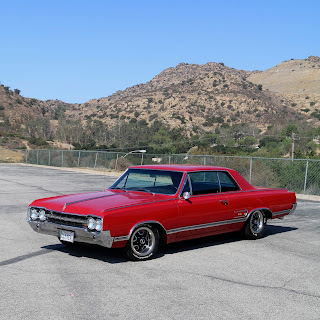 MB: I acquired the 65 Olds 442 about 4 years ago in early 2013 from a gentlemen in Canyon Lake, CA. I met him at the Temecula Rod Run car show and we became friends over the years. When he put the car up for sale, we negotiated the deal and I purchased the car. CCC: What type of condition was it in compared to today? MB: The 65 Olds 442 was in great shape, extremely straight, clean and all there. I had it repainted in its original Target Red color in 2015. Although its not all stock it is all Oldsmobile. It has a 1970 455 W30 engine with the big cam, 200R4 automatic overdrive trans, 3.55 gears with working A/C. It rides down the highway effortlessly. Out of all the GM A-Bodies, I think the Olds has the best ride. 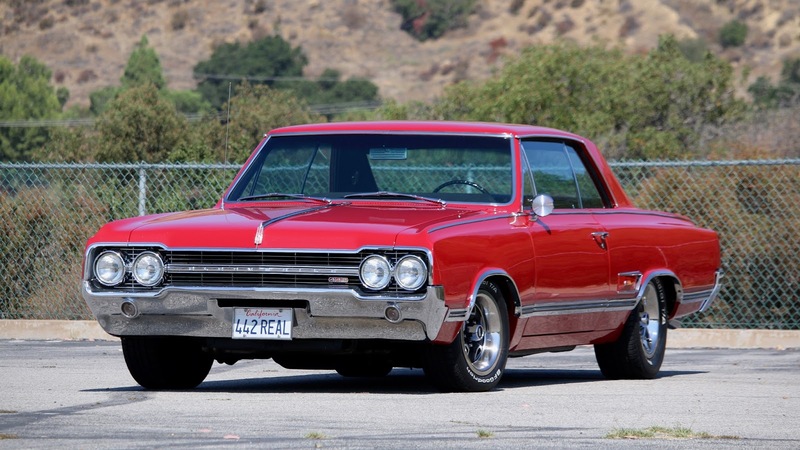 The 1965 Oldsmobile is finished in the factory color Target Red. Under the hood is a 1970 Olds 455 W30 engine topped with a Quick Fuel carburetor. The 442 also has a 200R transmission and Golden West suspension upgrades. CCC: What other vehicles are in your collection? 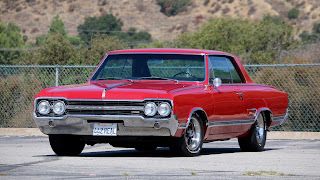 MB: I have a ’65 Mustang Fastback A-code car with a 289 and 4 speed, a ’66 Chevelle 300 Deluxe post car with a 427 engine and 4 speed, a ’68 Chevelle SS396 real deal 138 car, the first muscle car I ever purchased which is a ’67 Olds 442 with 455 and TH400, a ’66 Pontiac GTO 389 Tri-Power, 4 speed, factory AC car, ’64 Pontiac GTO 389 Tri-Power, 4 speed car and my last acquisition which was a ’63 Tempest Convertible 326, 3 speed and independent rear. I recently sold a ’67 Camaro RS/SS. CCC: Any new projects in the works or a car you are looking for? MB: My 1965 Ford Mustang fastback, I have the engine and trans out of the car for rebuild. Trying to decide should I go resto mod or rebuild to stock. 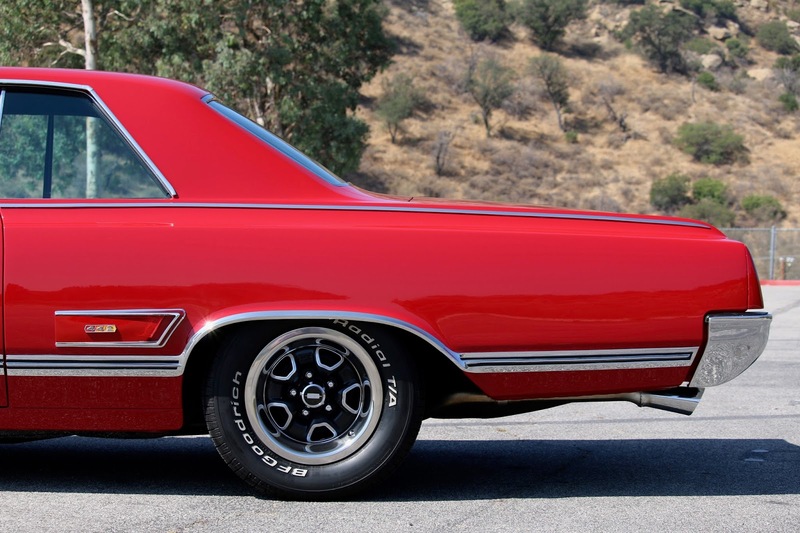 Also looking for a Buick GS, then I will have at least one example of all the GM A-body cars. CCC: What would be the dream car to add to your garage? MB: 66 Olds 442 W30, in ’66 the factory only made 54 W30 cars all in June of 1966. 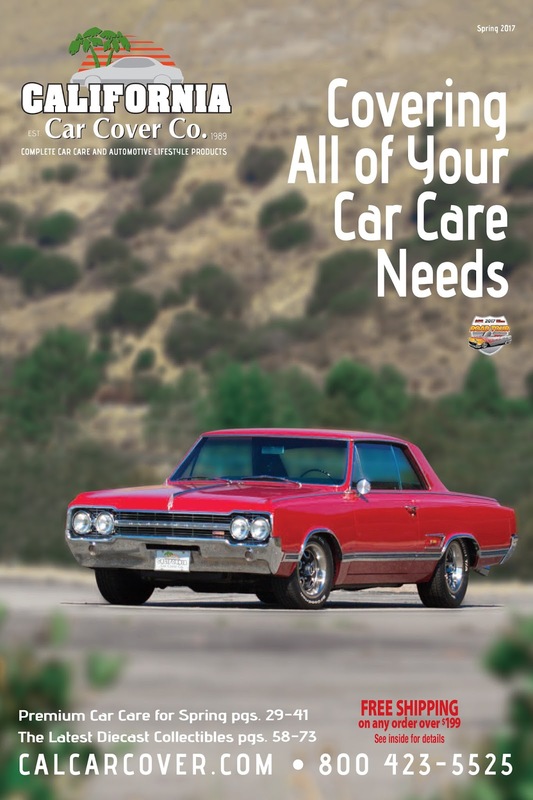 Please visit the California Car Cover website for the latest news and car care products.